According to Pardot, in 2016, 86% of marketers were turning to influencer marketing. The influencer marketing industry is now aggregated at $1 billion overall and is expected to grow at a rapid speed till the year 2019. While we know you want to jump right in, we also want to help you get the most of your influencer marketing campaigns. Understand the difference between influence and popularity. While the youngin, Kylie Jenner in the Kardashian family has massive online presence and popularity, her ability to convince and influence her audience to purchase her product is limited and not worth the million dollar contracts she charges. Consumers look at micro-influencers for trustworthy recommendations and honest opinions because they are perceived as everyday consumers just like us. Their recommendations are like suggestions from a friend or a family member. Because of that, micro-influencers bring about higher engagement rate by communicating and responding to their followers comments or opinions. Building strong, long-term relationship with your influencers could bring you favourable returns in the future. You should treat them like media contracts. If past campaigns had fruitful outcomes, you could potentially continue to work together on future projects. 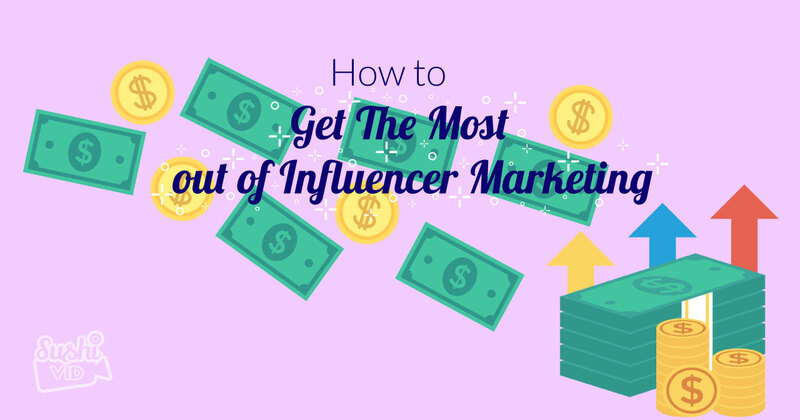 It saves you time on having to constantly build trust with new influencers. If you strip off the voice and creative freedom of an influencer, they most probably will lose interest in working with you and might potentially harm your relationship with the influencer. Don’t get me wrong, this doesn’t mean you allow the influencer to do whatever they want. As the brand side, you should provide them with guidelines and direction. It is unquestionable that you will have expectations and requirements, so be sure to make your specialisations clear to them regarding the campaign. A scripted content may not appeal to their audience and it could jeopardize the authenticity which the audience came for hence why brands should allow the influencers to create content in their own unique way because they know their followers better than anyone else. Influencer marketing increases brand awareness, social credibility and influence. It works like passing word-of-mouth from a friend or a family member. Once consumers convert to your brand, you’ll see them visiting your store and website frequently. Rome wasn’t built overnight, think big. What’s great about influencer marketing is that it’s new, trendy and fun. There are endless possibilities you can venture into- from giveaways, social media account takeover, unboxing videos, collaborations, creative hashtags and etc. The more unconventional it is the more you’ll be able to grasp the media’s attention and the more viral it gets… means you hit the jackpot! Influencer marketing can drive brand awareness at scale if you’re willing to put in the effort. Brands need to ensure to continuously assess infographic explores, measure results and determine strategies that need to be put in place. If goals aren’t met in initial stages, you will need to make necessary adjustments to your campaign. Looking for something else to read? Check out our post on why NOW Is The Time To Hire An Influencer HERE.